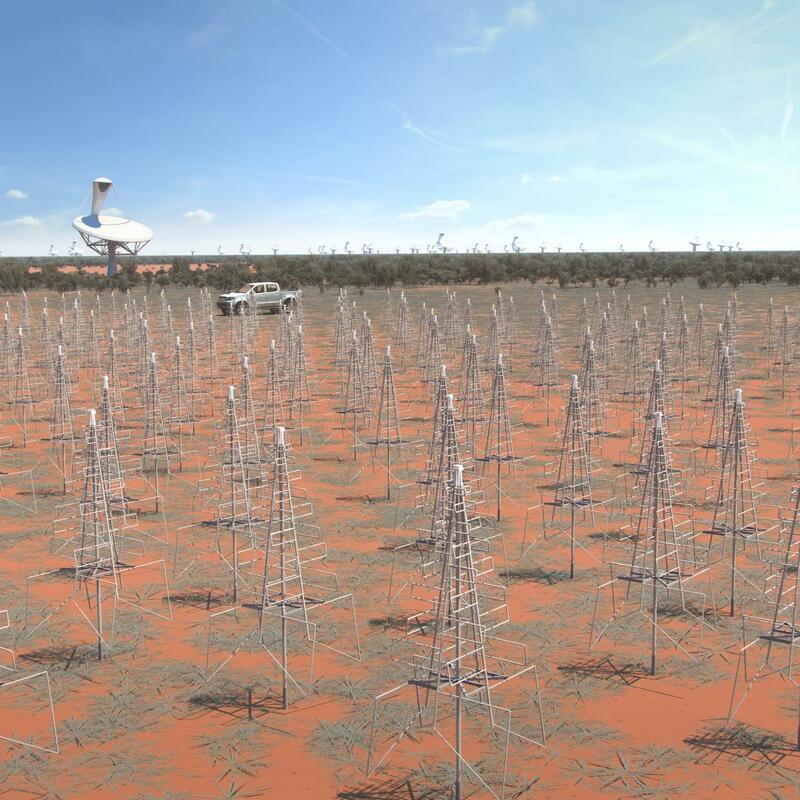 Under the joint hosting arrangements, Australia will host the SKA’s survey telescope and its low frequency aperture array antennas. In 2012 the SKA Organisation made the announcement that the telescope would be co hosted between South Africa and Australia, with Australia hosting two critical components not only to the final SKA, but also the cutting edge research which would lead up to it. The phased array feed (PAF) for ASKAP provides the antenna with a wide field-of-view (FoV) by creating 30 separate (simultaneous) beams to give a FoV of 30 square degrees (The width of your little finger at arms length is around 1 degree), speeding up survey time quite considerably. In Phase one, Australia will host several hundred thousand smaller ‘dipole’ antenna (each about a metre in height) which will intercept low frequency radio waves. This array will be expanded to several million antenna in Phase two. 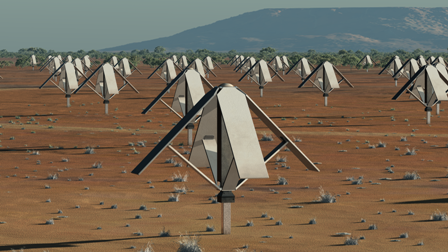 The MWA telescope is providing important input in to the design and science goals which the low frequency aperture arrays will be undertaking. Note: Although Australia and New Zealand submitted a joint bid to host the SKA, no SKA infrastructure is likely to be sited in New Zealand under the current dual site solution. Nevertheless, New Zealand remains a member of the SKA Organisation, and will maintain its close collaboration with Australia. Science and industry groups in New Zealand are currently preparing their contribution to the pre-construction phase. View the ASKAP and the Australian SKA site on Google maps. The Australian SKA Pathfinder (ASKAP) is a new radio telescope that is providing an important testbed for SKA technology and will itself be incorporated into Phase one of the SKA. The telescope has been designed and built by Australia’s CSIRO in collaboration with leading overseas astronomers and engineers. The Australian Government has committed funding of AUD $111 million to the Australian SKA Pathfinder. To help meet the scientific, technical and budgetary goals of the international SKA, the ASKAP telescope will develop and trial highly innovative new technologies on timescales consistent with the overall international SKA plan. ASKAP comprises 36 twelve metre dish antennas, each of which will be equipped with a multi-element receiver, or phased array feed, to enable unprecedented surveys of the sky. eld Array (MWA) seen in the image above, is a low-frequency radio telescope operating between 80 and 300 MHz. Already delivering first class science, it is located at the Murchison Radio-astronomy Observatory (MRO) in Western Australia and is one of three telescopes designated as a Precursor for the SKA. The MWA has been developed by an international collaboration, including partners from Australia, India, New Zealand, and the United States. It is became fully operational beginning in 2013. Whilst a precursor to the SKA it won’t be integrated in to the final SKA telescope, and will continue to work as an independent resource in its own right. The MWA will perform large surveys of the entire Southern Hemisphere sky and acquire deep observations on targeted regions. It will enable astronomers to pursue four key science objectives. The primary endeavour is the hunt for intergalactic hydrogen gas that surrounded early galaxies during the cosmological epoch of reionization. The MWA will also provide new insights into our Milky Way galaxy and its magnetic field, pulsing and exploding stellar objects, and the science of space weather that connects our Sun to the environment here on Earth. 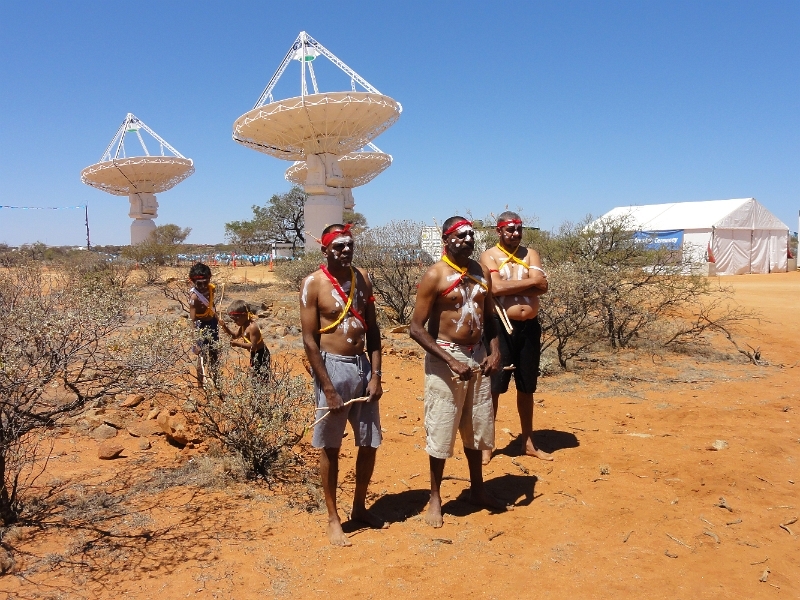 The Murchison region where the ASKAP and SKA telescopes will eventually be located, are traditional lands of the Wajarri Yamatji People, who signed an indigenous land use agreement, which protects the Aboriginal people’s cultural heritage. The agreement also brought significant benefits in terms of education and infrastructure to the local peoples in what is one of the most sparsely populated regions on Earth.